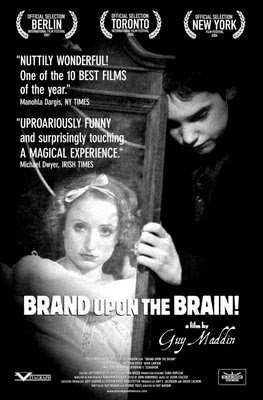 The Criterion Collection DVD of Guy Maddin's 2006 film Brand Upon the Brain! (trailer here) has just been released, and one of the special features is a documentary in which Maddin says his movie (which includes an island orphanage in a lighthouse where a mad scientist concocts a grotesque experiment, people communicate telepathically via souped-up phonographs, and a gender-bending girl-boy detective right out of Nancy Drew and The Hardy Boys inadvertently [or not] creates a triangle of young love) is "97% true". Paul Auster and Peter LaSalle! Night Shade Books continues to publish a wonderful variety of books with beautiful covers. Two books with great titles: The Age of the Conglomerates and The Defenestration of Bob T. Hash III. And, finally, The Horror Stories of Robert E. Howard and Adam Golaski's Worse Than Myself. I love the unconscious brain! Yesterday I went to the university library and took out a bunch of books, including The Arrival, which is very impressive visually and conceptually (I'd only looked at it -- "read" seems the wrong verb for a wordless book -- once in a bookstore, and wanted the chance to really stare; also, the director of the library, David Beronä, reviewed it for Rain Taxi, so I thought it would be fun to borrow it from David's library. 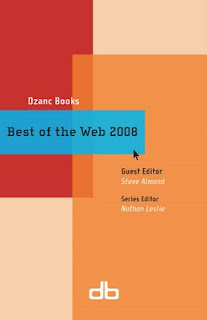 He was a very appropriate reviewer for it, since he's the author of Wordless Books: The Original Graphic Novels) and The Jameson Reader (what I really wanted was Marxism and Form, but the library doesn't have that [gasp! ack! ], so I was hoping to be able to trace some of the ideas I was trying to trace via the selection from Jameson's other writings). On August 18, 2003, I wrote the first post of this blog, a definition of the word "mumpsimus". The next day, I posted some ideas about what I thought would be appearing here. Then another post, some thoughts on a story by James Patrick Kelly. Five years later, the blog has lived longer than I ever expected it to, been read by far more people than I ever imagined possible, and the posts have had far more range and variety than I thought they would when I was guessing what might pop up in what I then called, with more accuracy than I could know, "this mad universe". When Weiss speaks of 'language' he means exactly what he says, the language which is studied by linguists, the noise you make with your face. Life here at Mumpsimus Central continues on apace, despite the slow pace of posting. I finally got done all that I needed to do for Best American Fantasy 2008 and so now can begin trying to get organized for the next volume. I finished acting in a production of Taming of the Shrew that was fun and successful, and I enjoyed the irony of that being the show I appear in before teaching an introductory course in feminism this fall at Plymouth State (in The Riverside Shakespeare, Anne Barton makes the strongest case I've read for the play's subversive elements, but I'm still not really convinced). And I'm slowly getting organized with all of the tasks I have here at the house, though this has not been helped by the phone line getting hit by lightning, the lawn mower needing major service, etc. I thought my next Strange Horizons column was going live next week, so I didn't notice when "Ordinary Zhang" was published earlier this week. But it was! The thesis of the column echoes some ideas I first brought up in my review of Paolo Bacigalupi's collection, but my primary purpose in writing it was simply to get people to read or reread Maureen McHugh's magnificent China Mountain Zhang. It took a few recommendations (including Kelley Eskridge mentioning it and Abigail Nussbaum writing a comprehensive review), but I recently watched all 18 episodes of the Canadian TV series Slings & Arrows, a smart and tremendously entertaining show about a theatre festival very similar to the Stratford Festival, where many of the actors in the series have appeared. Meanwhile, here are some good things for your ears: 1.) Kelley Eskridge on the Reality Break Podcast. Since becoming familiar with her work over the past year or so, I've thought Kelley is among the smartest and most thoughtful writers I've recently encountered, but not everybody who seems smart and thoughtful on the page is also able to seem smart and thoughtful in a conversational interview. Kelley is.